"The classic Acadian way to cook smelt is to fry them. I put a twist on that tradition by frying them in this light tempura batter my husband and I use for shrimp. I serve this with heads on because, like anchovies, these fish are so small everything is edible. But you can remove heads and internal organs if desired." Whisk rice wine and 1/2 teaspoon salt together in a bowl. Lightly dust smelt with about 1 tablespoon flour. Add smelt to rice wine mixture; cover bowl with plastic wrap and marinate in the refrigerator for about 20 minutes. Heat oil in a deep-fryer or large wok to 375 degrees F (190 degrees C). Mix ice water, 1/2 cup flour, cornstarch, egg yolks, sesame seeds, sesame oil, baking powder, sugar, and 1/2 teaspoon salt together in a bowl. Remove smelt from rice wine mixture and dip, 1 at a time, into the flour mixture until evenly coated. Discard remaining rice wine mixture. 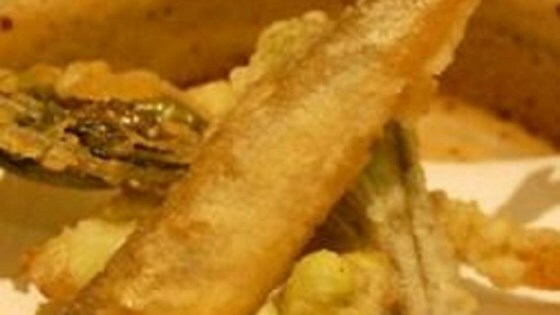 Carefully fry smelt, 2 or 3 at a time, in the hot oil until golden on all sides, 3 to 4 minutes. Remove with a slotted spoon and drain on paper towel-lined plates. Repeat frying with remaining smelt. Serve warm. See how to make a crispy, meaty appetizer for game day. Reckon about 6 to 8 smelt per person for a starter, and twice that for a main course. Very good batter. Nice and crispy.